Taken on 20th October 2011. 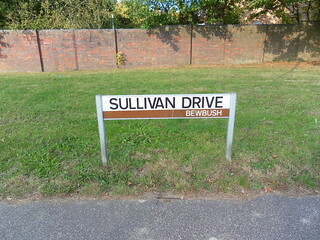 Crawley’s 12th neighbourhood, Bewbush, was allocated this brownish colour (paler than Southgate’s brown) in the neighbourhood street sign colour scheme, in existence since the earliest days of the New Town. The road runs from the centre of the estate to the A2220/A264 roundabout, close to Bewbush Manor House and the church (the neighbourhood’s only two listed buildings).